After my Hostel 101 post, I wanted do a hostel review of my time at Mayan Monkey Hostel in Mexico. One of my favorite ways to live while traveling is by hostel, and during my solo trip through the Yucatán peninsula, I wanted to find the best hostels in Mexico. It’s hit or miss for some, but I think it is a great way to travel and meet new people. I am by no means rich, have a cushy corporate job, nor do I have a trust fund. Therefore, you can classify me as a budget traveler, meaning I am all about that hostel life. Here’s the first of three hostels I stayed in throughout Mexico, starting in Cancún. When planning my solo trip through Mexico, I knew I was not spending much time in Cancún. I looked for a hostel near the bus station, that included a meal or two in the price, and looked nice to stay in for a night. Budget was a biggie for me, though I found many of the hostels in Mayan Monkey’s vicinity are beyond affordable. I arrived late at night, so instead of walking I caught a taxi! But I think it’s 100% walkable from the ADO bus station if you know where you’re going. I didn’t and the traffic was a bit much for me to navigate after an evening of travel. This was all put at ease when I arrived at Mayan Monkey. Mayan Monkey is one of the cheap hostels in Mexico. It was $18 (USD) for one night, which included breakfast and dinner! Thus, it is very affordable for anyone on a budget and wanting to splurge on other parts of their trip. Mayan Monkey is also a great option for travelers who don’t want to splurge on an expensive resort. For the price tag alone, I think Mayan Monkey Hostel is one of the best hostels in Cancún. Since I was only staying in Cancún overnight, I needed a hostel that was close to the bus station so I could easily leave the next morning. If you’re just passing through Cancún, Mayan Monkey is perfect. It is located five minutes away from the bus station, where the ADO buses depart for areas all around Mexico and to the airport. I don’t know if there are other Cancún hostels that are closer to the resort area (if that is where you want to be), however I met many guests who took a taxi to get to the beach. They write your name on your bed! Mayan Monkey has a very sleek, yet casual vibe. There are two bunk beds in a set, with 3 sets situated around the room. Out of all the hostels I have stayed in, from Mexico to Amsterdam, Mayan Monkey’s layout is one of my favorites. There was even a cubby for important items above the pillow, a lamp which is useful if you get up early (or arrive late) and don’t want to bother the other guests. There are also curtains for each guest along each side of the bunk bed, which is wonderful for privacy as you sleep. The bathroom is also located in the room! Some hostels have bathrooms across the hall or downstairs, but Mayan Monkey’s in convienently located inside the room to be shared with 5 people instead of the entire hostel. 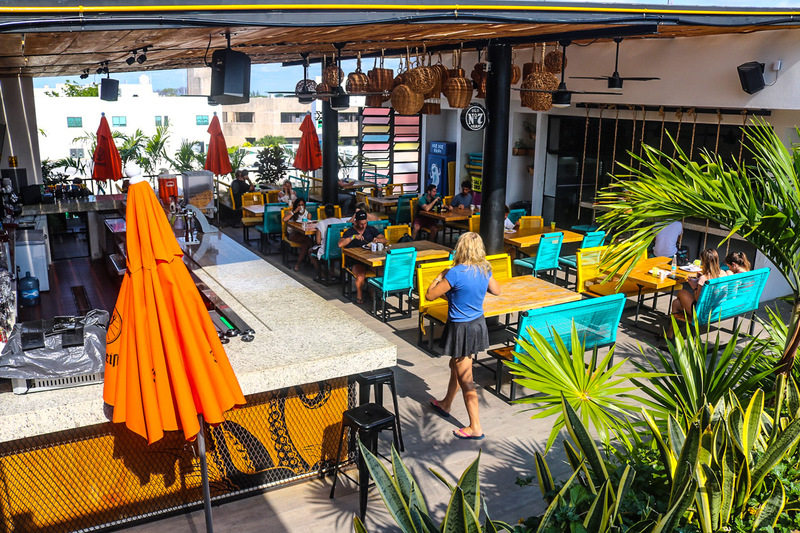 One of the coolest aspects of Mayan Monkey is the rooftop bar! Called the Banana Bar, this is a colorful area is also where the swimming pool is located. I did not spend much time here, therefore I am not aware of the drink prices. If I were staying longer, I would use this area to socialize with other guests who may also be solo travelers. As I mentioned previously, Mayan Monkey includes breakfast and dinner in their price at their Banana Bar. I was pleasantly surprised with the breakfast because it was not the continental style I became accustomed to in my European travels. There was toast, juice, and cereal, however there were also cooks available for made-to-order omelets! I missed dinner the night before, but the breakfast was delicious so I trust the dinner too. Both meals came at no extra cost, meaning they were included in the $18 price, and my love for Mexican hostels skyrocketed. There are common areas to sit on couches or chairs on every floor to relax! Other common areas include the Banana Bar and swimming pool on the rooftop. These living spaces would be nice to unwind after a long day of touring Cancún. Or, they are also the perfect areas to mingle with other visitors. I met two incredible black travelers within minutes of sitting down in the common area, and we ended up chatting over tacos for hours! Mayan Monkey was pristine. The rooms themselves were clean with sheets and a pillow all ready to go. All areas are cleaned during breakfast time daily. The bathroom was also clean, in addition to the common areas, swimming pool, and Banana Bar. Since I went in May, air conditioning was a must and Mayan Monkey circulates air through the hostel perfectly. Honestly, it set the bar high for hostels in Mexico. For comfort, I sleep like a rock pretty much anywhere and this was no exception. The mattress was beyond comfortable. If you want a warmer blanket bring one with you! However, the sheets were good enough for me. Mayan Monkey also offers a towel, a city map, and free Wi-Fi. I never felt unsafe in this hostel (or any other hostels in Mexico). To enter the room, each visitor receives a smart card to access their room and everyone has their own locker too. I always bring my own lock for lockers! Also, I walked from the hostel to the bus station to leave, and across the street for dinner, and had no issues. The staff at Mayan Monkey was good too. I did not need their services too much, aside from asking for an exchange counter to trade in my American dollars for Mexican pesos. I arrived after 8pm and the counter was still open for me to check-in and go to my room. Their check-in hours are 3pm to 11pm, with check out by 12pm. Exchange some cash at the airport to pay for the room as they don’t accept credit cards. There is also no smoking, but I found this is common for Mexican hostels. Would I recommend Mayan Monkey? Absolutely! I think Mayan Monkey is great for budget travelers, group trips, backpackers, and solo travelers who love to socialize. The environment (and people) are as friendly as they come! Mayan Monkey has the reputation of being one of the best hostels in Cancún, and it did not disappoint. If I stopped in Cancún again, I would choose to stay at Mayan Monkey. The location, price, and amenities are a steal for the price. With the swimming pool to the food, it is an ideal location for a short stay in Cancún. I would even extend my trip an extra day or so. I look forward to returning in the future! Thanks for reading! Share the info and PIN this post!